The Comoros are an island nation off the coast of East Africa, in the Indian Ocean between northern Mozambique and northern Madagascar. To be sure, you won’t want to come here unless you’re seeking adventure and can endure a more rugged way of life. This nation has a tumultuous history, but it’s also one of those few rare, isolated places that you can truly make into your own. Moroni is Comoros’ largest city, and although the rest of the country has inadequate transporation infrastructure, this city offers an exception. It is served by the Prince Said Ibrahim International Airport, but there is also a harbour with regular transport to the African mainland and the other islands in the Comoros archipelago, as well as Madagascar and other Indian ocean islands. In Cormorian, Moroni translates as “in the heart of the fire”, perhaps alluding to the city’s proximity to majestic Mount Karthala. If you do make it here, you’ll be rewarded with many excellent beaches, unspoiled by the kind of tourism you’d find somewhere more accessible. The Ancienne Mosquée du Vendredi (Old Friday Mosque) is a popular tourist spot too. The city’s estimated population in 2003 was only 60,200 residents, and the nation as a whole is one of the world’s poorest. But that means this is somewhere your independent wealth can take you a long way. 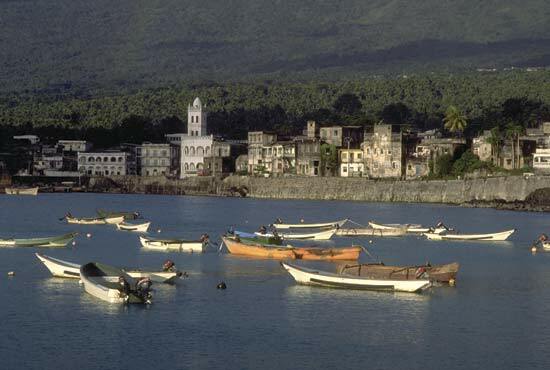 Although Comoros has endured 20 coups or attempted coups since gaining independence from France in 1975, in December 2001 voters approved a new constitution and presidential elections took place in the spring of 2002. Today’s government remains relatively stable. The country officially consists of the four islands in the volcanic Comoros archipelago: Ngazidja (French: Grande Comore), Mwali (French: Mohéli), Nzwani (French: Anjouan), and Mahoré (French: Mayotte), as well as many smaller islands. However, the government of the Union of the Comoros (or its predecessors, since independence) has never administered the island of Mayotte, which France still administers as an overseas collectivity. The archipelago is notable for its diverse culture and history, as a nation formed at the crossroads of many civilizations. It’s one of the chief reasons you may consider visiting here. And there are three official languages: Comorian ( Shikomor), Arabic and French. As said, it takes a certain kind of expat to take on a project like Comoros, but they could certainly use your help. In the process, you might just fall in love with these little volcanic islets and want to stay.